Η ΕΙΚΟΝΟΓΡΑΜΜΑΤΗ και ΠΑΛΑΙΟΓΡΑΜΜΙΚΗ ΓΡΑΦΗ (από Μπουζάνη - Bouzanis K.): Minoan, female figurine with inscribed supplication! 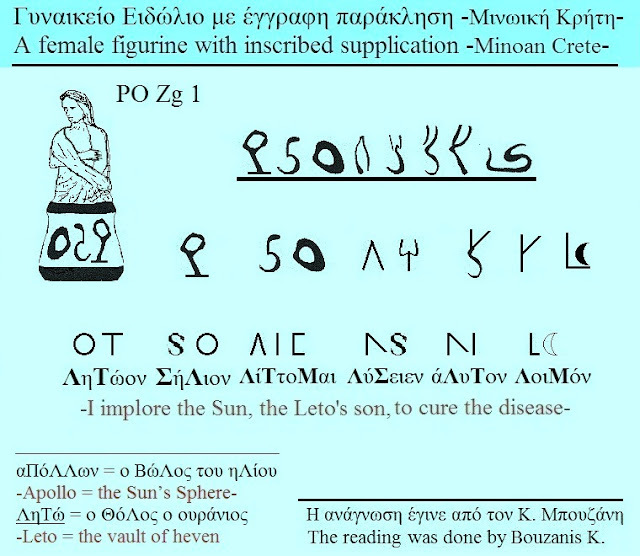 Minoan, female figurine with inscribed supplication! 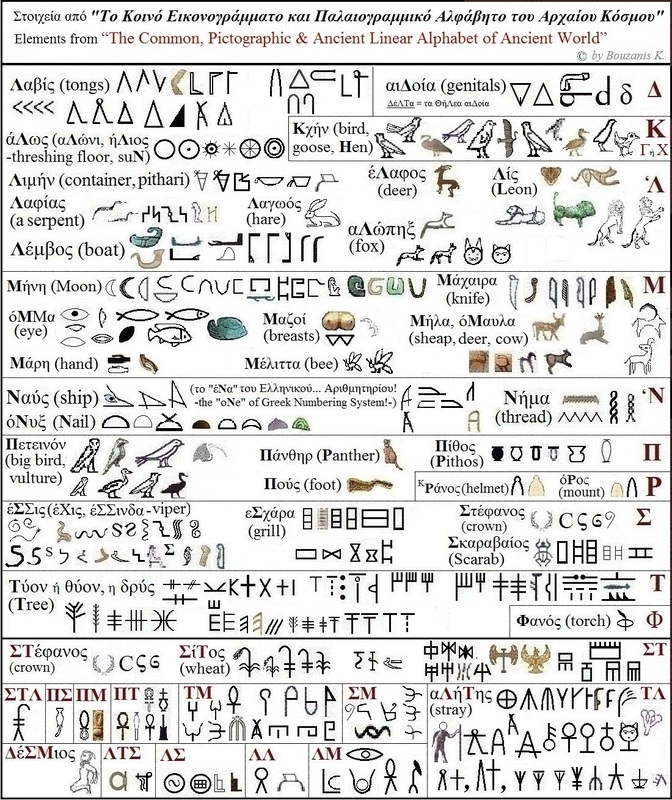 The Ancient World is full of inscriptions with the Common, Global, Pictographic & Ancient Linear System of Writing-Reading of ancient speech! And here, on this figurine, from Poros Heraklion Crete, beats the heart of Hellenism! 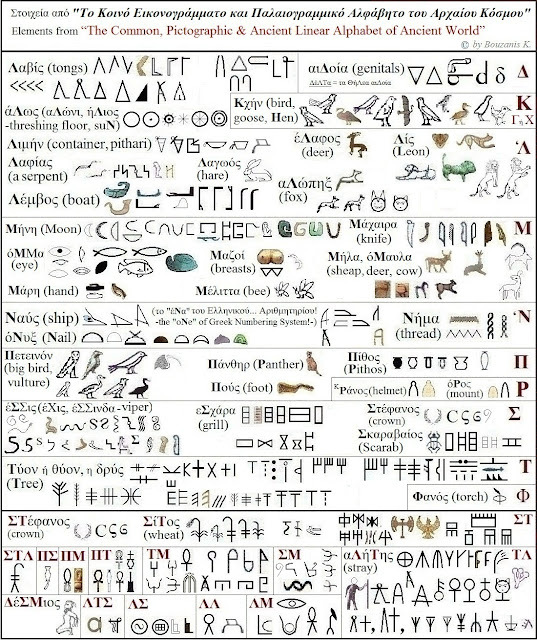 The engraved, carved or written decoration on utensils, tools, containers, jewelry, coins, votives, buildings, tombs, etc., anywhere, not constitute, exclusively, inspired artistic representations or symbols, such as at first sight seems on unsuspecting or illiterates... every era, but, very often, texts-inscriptions. Really, what else would need to write someone on a figurine of a priestess of Apollo from Minoan Crete? The reasonable person have voice, and in Prehistoric Globalized World, because of trade, could not change the Codes of Systems of Inscript and Reading neither every one thousand nor every more thousands years! We, here, will teach Eikonogrammati and Palaeogrammiki Scripture. [Profytevo = I am preparing the soil to make the planting or, figuratively, to write the... history! Αναρτήθηκε από Μπουζάνης Κων. - Bouzanis K. στις 11:58:00 π.μ.